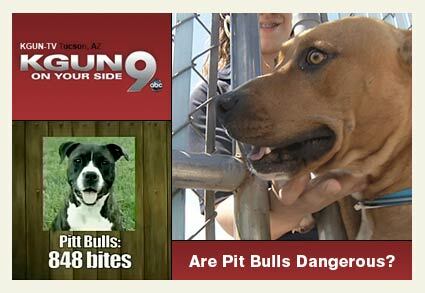 Tucson TV Station Airs Segment About Pit Bulls: Are They Really Dangerous? The segment also interviews Sally and Richard Andrade. After their dog Fabian was killed by a loose pit bull in 2009, the couple set out to pass a new state law. Their dream came true April 25, 2011 when Governor Janice Brewer signed Fabian's Law (HB 2137) into law. The new legislation increases penalties for owners of aggressive dogs involved in attacks upon pets and humans. Prior to its passage, there were no civil or criminal penalties in Arizona for pet-on-pet attacks. We remind readers that there is no dispute about the dangerousness of pit bulls in high courts across the country: "Unlike dogs who bite or attack merely to protect a person or his property and then retreat … pit bulls besiege their victims relentlessly, until severe injury or death results" (Ohio v. Anderson) Pit bull dogs possess a strongly developed "kill instinct" not shared by other breeds … pit bull dogs are unique in their "savageness and unpredictability." (Hearn v. Overland). Reporter Tammy Vo also interviewed Lt. Jose Peña Jr. of Santa Cruz County Animal Control. Peña explained to Vo that like many other open admission shelters across the country, they no longer adopt out pit bulls. "It's a liability issue that cities and counties look at," said Peña. The segment closes with dog bite statistic data from Pima County Animal Control. Unsurprisingly, pit bulls lead all biting incidents with 848 bites followed by German Shepherds, 633, and Labs, 496. Solutions Instead of the "Same Old" Debate? What percentage of pit bull attack victims in your jurisdiction receive "proper" civil recourse after a mauling, which often requires at least one emergency reconstructive surgery and follow up treatment? What percentage of pit bull owners have the necessary insurance coverage or financial resources to support these extensive medical costs, which start at about $20,000 and quickly escalate beyond? What action can be taken to greatly reduce the "breed-specific" pit bull overpopulation problem plaguing your open admission shelter? Who is profiting from the continued unregulated breeding and selling of pit bulls, many of which end up in your open admission shelter? 1: Aim for a percentage much lower than victims of automobile and occupational accidents. 2. Require liability insurance coverage of $300,000 for all pit bull owners (See: Merrillville, IN law). 4. Irresponsible pit bull owners, dog fighters and criminals who are using the dogs as guard dogs. Solutions or More Disfigurements and Deaths? It is imperative to focus on solutions instead of the "same old" debate, which began in earnest in 1980 in South Florida, "Pit Bull Attacks as Owners Fight Image," (January 24, 1980)2 and "Please, No More of that Garbage About the Gentle Pit Bull" (July 21, 1985). By 1987, in a People Magazine article titled, "An Instinct for the Kill," Minneapolis animal control officer Dave Nordmeyer predicts, "Every city in this country is going to have tragic problems with the (pit bull) breed." Here we are today with an obscene number of pit bull maulings since 1980 and of these maulings, 255 resulting in an American citizen's death. We have the additional problem of unwanted pit bulls glutting open admission shelters across the country. Staying stuck in the "same old" debate -- Are pit bulls really dangerous? -- disregards established appellate court rulings and a growing number of medical injury studies and assures the continuation of new horrific pit bull maulings. 1Angela's comment reminds us of what Amaya Hess's mother said in 2009: "The question that everyone asks me, is 'how was she burned?' Well, she wasn't burned. She was attacked by a dog." 2The controversy in South Florida began after the brutal mauling of 6-year old Frankie Scarbrough in December 1979, followed by the near fatal mauling of Ethel Tiggs by her own two pet pit bulls. Even at that time, 35-years later, the 1945 fatal pit bull mauling of Doretta Zinke in the region was remembered. Very refreshing to see that Forrest Carr and Tammy Vo are not letting themselves be bullied into giving up common sense and reasoning skills! I hope many more follow! "Certainly most pit bulls never bite anyone. By the same token, the vast majority of lightning bolts never kill and only a small handful of sharks ever bite a human. But that does not prove that lightning bolts and sharks are safe." "The "Pit n' Proud" mission statement posted on its own Facebook page declares that it is dedicated to the defense of "the American Pit Bull Terrier and related breeds" (the italics are mine). Bottom line — you can't embrace "mixes" and "related breeds" when they're behaving well but then turn around and disavow them when they kill someone." Pit-Advocates…Fight for the Right to Bite! If they spent 1/10th of their energy and resources going after the breeders and dog fighters pumping out dangerous Pits, they might actually help society. Instead, they demonize victims and are actively saving dogs involved in attacks. Then in the next sentence, give assurances of safety because "Dogfighters culled manbiters"
All under the guise a tax free status. "they demonize victims and are actively saving dogs involved in attacks. Then in the next sentence, give assurances of safety because "Dogfighters culled manbiters""